"Let’s be clear: by design, this law (i.e., the Affordable Care Act, generally referred to as ObamaCare) can work if and only if enough young people are willing to pay premiums far higher than are actuarially fair in order to subsidize workers my age who on average earn far more than the young workers who are subsidizing them. Even if one takes into account that Millennials in the long run eventually will become old themselves and benefit from these subsidies, Obamacare still is an extraordinarily bad deal that effectively would force today’s 18-year olds to pay 18 percent more for their medical care over a lifetime than if each generation paid its own way. Such an age-related tax is unconscionable. Imagine if sales taxes or income taxes included a surcharge for everyone who happened to be a twenty-something. If this idea sounds preposterous, welcome to Obamacare. "Moreover, if fully implemented, this law will strip the economy of more than 1 million jobs and relegate another 10 million full-time workers to part-time status. In both cases it will be young, inexperienced workers who bear the brunt of these adverse effects on work effort. Equally appalling, the law will discourage young people from getting married even though all the empirical evidence shows that marriage is one of the most potent anti-poverty programs in any society’s arsenal. Worse, if honestly scored, the law will add $2 trillion to the federal deficit in its first 20 years, an amount that largely will be borne by today’s youth and their progeny, if indeed they can afford to procreate. And perhaps most sickening of all, RAND Corporation scientists estimate that as a result of the law at least 3.8 million Americans who already have coverage they like will not only lose that coverage, but will end up remaining uninsured." HT His column, "Why Aren't Millenials Marching in the Street over ObamaCare?," posted 11/21/13 at Forbes magazine's website. Yesterday, we growled that three years after a devastating earthquake, thousands of Haitians are still homeless while $230 million -- of $651 million that was appropriated -- has not yet been disbursed and construction for a projected 15,000 permanent homes has been scaled back by 80 percent – to 2,649 – and delayed by two years. "A year after Sandy landed on shore, not only are most of the checks not written but for the bulk of the cash awarded most agencies haven’t even figured out what they are buying. "With each passing month, the Sandy spending increases, but money outlayed for disaster relief one year after the disaster is hardly emergency spending. Some agencies and departments are using up the appropriated funds at a faster rate than others though, perhaps indicating which agencies met the most urgent need for federal relief." Some examples: USDA has obligated 4.17% of its appropriations, but spent only 1.07%, but Homeland Security has obligated 53.87% of the money appropriated and spent 37.44%. TCS provides four tables with the sorry details. "A year removed from Sandy, we see it was not just the second most costly natural disaster but a prime example of what’s wrong with national disaster policy. Despite claims of poverty and need, the slow walk of delivering the aid shows this is a great example of Washington’s penchant to use an event, even a natural disaster which evokes the natural inclination to help, as a political opportunity to garner taxpayer cash for pet projects. Also, disaster spending should come with strings to ensure communities plan for the inevitable disasters of the future. We don’t know where and when, but we do know these disasters are going to occur. "Superstorm Sandy and the experience with the supplemental funding should be a wakeup call for the need to change how we respond to and prepare for disasters. Every dime we spend on disaster recovery should ensure that we don’t have to spend that same dime again in the future." In a separate report, earlier this year, TCS argued that "current policies promote risky development" and that we have an opportunity for a more rational disaster policy." According to a CNS News article, posted yesterday, Barbara Boland reports, "On Jan. 12, 2010 an earthquake in Haiti displaced 2 million people and caused an estimated 230,000 deaths and 300,000 injuries. After the earthquake, Congress passed the Supplemental Appropriations Act with $1.14 billion allocated to reconstruction in Haiti. Of that, USAID is responsible for allocating $651 million." "This means that while originally 75,000 to 90,000 Haitians would have had access to housing, that number is now reduced to the 13,200 - 15,900 range. "These decreases came about due to miscalculations of costs and the Haitian government’s request for “larger houses with improvements such as flush toilets,” according to the report. "The report details several miscalculations on the costs for building permanent housing, port construction, an industrial park, and an electrical power plant. There are also significant delays with each of these projects." "USAID has allocated $72.5 million to plan and build a new port in northern Haiti. As of June 2013, the agency obligated only $4.3 million (6%) because of planning delays. There was no staff in Haiti with the technical expertise needed in either construction, oversight or planning to build the port. There was also no port engineer available to oversee the project. "According to the U.S. Army Corps of Engineers, more studies are needed to determine the feasibility of building the port, and these studies will take between 18 months and 2 years. "Estimates on the time to build the port were originally 2.5 years but have now ballooned to 10 years, depending on how complex the port design will be. The costs to build the port also remain uncertain, with a feasibility study showing a cost ranging from $185 to $257 million. Given that USAID planned to pay $68 million for the port, this leaves a substantial gap of $117 million to $189 million. "As of Oct. 9, 2013 when the GAO report was released, it is unclear that the Haitian government will be able to find a private sector company willing to finance the rest of the port building project." Sounds like USAID isn't doing any better helping Haitians recover as FEMA did recovering from Hurricane Katrina in 2005. Access to the GAO is here, including access to a one-pager of the highlights. "What the battle over Obamacare has helped to reveal is that it isn't just two clashing interpretations of the same Constitution that divide liberals and conservatives today. It is increasingly two different constitutions that are locked in conflict. Liberals support the "living constitution," which regards the bulk of the 1787 document as dysfunctional under modern conditions, hence obsolete if not, indeed, dead. They recognize only a few phrases in a few amendments as truly vital. "Conservatives cling to the old Constitution (as amended) not merely because it is old but because its principles of justice, based in human nature, are correct, and because its institutions and customs wisely anticipate both human greatness and human baseness. From this point of view, it is the passage of Obamacare—with its hasty party-line votes, corrupt side-deals, and brazen lawlessness—and not its attempted repeal, that amounted to a constitutional dysfunction." HT Kesler's essay, "The Tea Party and the Constitution," Claremont Review of Books, Claremont Institutie. It's a short article, and well-worth reading in its entirety. Federal Bureaucrats Hard at Work in the Caribbean? "A group of federal officials skipped chilly Washington this month for a taxpayer-funded trip to the Virgin Islands in the name of protecting the world’s coral reef. "The organizer, the U.S. Coral Reef Task Force, isn’t saying much about the total cost or reasons for the trip or why officials chose the St. Croix beachfront resort Buccaneer Hotel (made famous by an episode of TV’s “The Bachelor”) as their destination. "But life couldn’t have been too bad for the G-men and G-women at the swanky resort, which is surrounded by a lush green golf course and boasts rooms with rates that begin at $323 a night. “Gracious, elegant, legendary” is how the 17th-century resort bills itself. "Federal officials defend the trip by saying that on-scene experience about Caribbean coral reefs is important to the mission of conservation. They also emphasized that they managed to get a special government discount rate of $135 a night for the hotel, topped off with a $74 meal per diem." "But for fiscal watchdogs clamoring for reducing spending and the national debt , the trip stands as a powerful symbol of a government that has little sensitivity to appearances or the bottom line. “Taxpayers expect accountability regardless of whether a particular meeting was held in a coral reef or in a Hyatt,” said Tom Schatz, president of Citizens Against Government Waste, a fiscal watchdog group. "For jetting off to the Virgin Islands at a dubious time of year and making it difficult to monitor its costs, the U.S. Coral Reef Task Force wins the Golden Hammer, a weekly distinction from The Washington Times awarded for examples of wasteful or excessive spending." Kudos to Phillip Swarts and the Washington Times for reporting on this abuse and waste of federal tax dollars. Read Dan Mitchell's entire Townhall column for more waste, fraud, and abuse by federal bureaucrats. At American Thinker today, Tom Lifson writes that he's "glancing out the window looking for airborne swine, for the New York Times today published an op-ed revealing to its readers for the first time that redistribution of wealth is the engine that powers Obamacare. John Harwood, who works for the Times and CNBC, began by pointing out the Obama administration's aversion to the term "redistribution." While at Hot Air, Erika Johnsen introduces the New York Times' op-ed similarly, writing, "I would almost call it a bit of a zinger from the New York Times, except that they still do their level best to couch the essential facts with every possible excuse." "Mr. Obama’s advisers set out to pass the law in 2009 fully aware that fears among middle-class voters sank President Bill Clinton’s health initiative 16 years earlier. So they designed the legislation to minimize the number of people likely to be hurt. "Instead of a sweeping change to a government-run “single-payer” system favored by Democratic liberals, members of the administration sought to preserve the existing system of employer-provided health insurance while covering the uninsured through the expansion of Medicaid and changes to the individual insurance market. "They also added benefits available to any family, such as the ability of children up to age 26 to remain on their parents’ health plans. "But throughout the process, they knew that some level of redistributing wealth — creating losers as well as winners — was inescapable. "Mr. Obama survived that episode and other instances when Republicans deployed old recordings of him using the word “redistribution” as evidence that he was a closet socialist. But Mr. Obama had learned a lesson." "Obamacare is the biggest assault ever on the middle class. "If not radically altered or repealed, it will diminish lifestyles and increase the financial struggles of average individuals and families. Combined with other costly government meddling in the economy, it will destroy the concept of an American middle. "Incomes that over the past decade have barely kept pace with inflation will not absorb the surging cost of health insurance that will come for many, if not most people, on Jan. 1." "Control of troubled Anaheim automaker Fisker Automotive moved to Hong Kong billionaire Richard Li on Friday, after the federal government completed its auction of a company loan. "The U.S. Department of Energy sold its Fisker loan for $25 million to a holding company called Hybrid Technology LLC. U.S. taxpayers wound up losing $139 million on the government’s backing of the luxury hybrid carmaker. "Hybrid Technology is owned by Li, according to a spokesperson for Marsha Blackburn, vice chair of the U.S. House of Representatives Energy and Commerce Committee." Finally, at Hot Air yesterday, Erika Johnsen closes her post on this story by saying, "And no, the Obama administration will not be apologizing for their big-government, cronyish, taxpayer-money-squandering antics — and in fact, they have every intention of plowing ahead with them." "Taxpayer money is reportedly being used to fund an Afghan company with ties to terrorist organizations, according to Special Inspector General for Afghanistan Reconstruction (SIGAR) John Sopko. In a letter to Secretary of Defense Chuck Hagel from earlier this month, Sopko discussed the case of a contract with Zurmat Material Testing Laboratory, which supplied bomb-making materials to insurgents. Zurmat is just one example of a broader problem, however." "According to SIGAR, the issue is much broader, as the U.S. government has paid $150 million to companies in Afghanistan with links to insurgents. "Zurmat Material Testing Laboratory, part of the Zurmat Group, received government funding to build American-controlled facilities in Afghanistan in November 2012, despite being flagged six months earlier by the Department of Commerce because it supplied bomb-making supplies to insurgents, the Nov. 8 letter said. "On Sept. 17, 2012, U.S. Central Command identified the Zurmat Group and its subsidiaries as “actively supporting an insurgency.” Marine Gen. James Mattis, then the CENTCOM commander, invoked the federal law that prohibits U.S. armed forces from contracting with the enemy, and he requested that the Zurmat Group be formally banned from doing business within CENTCOM’s area of operations. "But neither move prevented Zurmat employees from gaining access for two days to the Parwan Justice Center Complex, which includes a U.S.-run prison at Bagram Airfield. SIGAR uncovered the issue in a 2013 audit into the project that uncovered construction defects. "The inspector general in 2012 referred 43 cases to the Army Suspension and Debarment Office because the companies allegedly provided financial support to the Taliban and other terrorist organizations in Afghanistan. The Army Suspension and Debarment office has the power to "debar" or blacklist errant contractors." "Israel’s comment preceded by one day House consideration of H.R. 3350, which “permits a health insurance issuer that has in effect health insurance coverage in the individual market as of January 1, 2013, to continue offering such coverage for sale during 2014.” When reporters asked his opinion on the legislation, Rep. Israel stated that the Obama administration already had everything under control, and that the Republican legislation was just another move to sabotage the Affordable Care Act (ACA). “It is no longer necessary to fix the problem because the administration has fixed the problem,” Israel said. “It (the Republican legislation) is only necessary if it is designed as yet another attempt to ambush and sabotage the law.” H.R. 3350, the “Keep Your Plan Act,” was passed with bipartisan support on November 15 by a 261-157 vote. "Rep. Israel’s argument certainly came as a surprise to the American people. McKinsey & Co. warned senior White House officials in April of the inefficiencies that would occur if the Obamacare website roll out was launched as planned. Between 4 and 5 million Americans (and counting) have lost their existing healthcare plans since October 1, and just over 106,000 have enrolled since November 1, which is far below the administration’s estimates. In the face of both growing discord from even members of the Democratic party, and anger from the American people, who were misled by President Obama’s pledge of “if you like your plan, you can keep it,” it seems as though the administration is far from securing a permanent fix to anything." "Although there have been an array of dishonest and downright misleading claims made regarding Obamacare in the last month, Rep. Israel’s statement is not only ignorant of the truth, but blatantly disrespectiful to the majority of Americans who look unfavorably on the law. Obamacare is the over cooked, dry turkey of a federal program that Democrat’s are trying to shove down the taxpayers throats for Thanksgiving dinner. "For having uttered this patently partisan and preposterous statement, CAGW names Rep. Israel its November 2013 Porker of the Month." Kudos to Citizens Against Government Waste. CAGW is "a nonpartisan, nonprofit organization dedicated to eliminating waste, fraud, abuse, and mismanagement in government." Additional information about CAGW is available here. "An analysis by the House Committee on Oversight and Government Reform found that judges with approval rates higher than 80 percent, about 30 percent of all administrative law judges (ALJs) nationwide in past years, awarded billions of dollars in benefits in almost 140,000 cases as recently as 2009. The number of awards has since declined to about 46,000 last year. “Not all of those are incorrect but there are significant amounts,” said Rep. James Lankford (R., Okla.), chairman of the Subcommittee on Energy Policy, Health Care and Entitlements, at a hearing Tuesday, adding that even small amounts of improper payments can imperil the program for the truly disabled. “We cannot ignore glaring issues that are driving this program into insolvency,” he said. "Almost 11 million disabled workers, spouses, and children receive SSDI benefits—a 45 percent increase from a decade ago—with average monthly payments of $1,130 for disabled workers and $300,000 total over their lifetimes. Social Security estimated in 2009 that less than 1 percent of more than 560,000 beneficiaries reviewed would eventually leave the system because of improved health, suggesting that many recipients stay on the program for life once they start collecting benefits." "Social Security’s inspector general and the Government Accountability Office have found billions in improper payments disbursed to workers who were not disabled and children in recent years. The SSDI trust fund will be depleted in 2016, according to the Social Security and Medicare Boards of Trustees, resulting in benefit cuts unless reforms are made. "Structural reforms, rather than more funding, are most vital to ensuring that the truly disabled receive benefits, Lankford said. "Benefits for the disabled “are going to be cut the same from people defrauding it if we don’t solve it,” he said." If you are tired of liberal reporting from the mainstream media, be sure the Washington Free Beacon is part of your daily reading. "So what would the Founders say if they saw trillions of dollars being taxed away from society's productive members to provide means-tested benefits to around a third of the population? "What would they say if a family of four -- grandma, mom, and two kids, say -- lived without working in subsidized housing on welfare, food stamps, Medicaid, and other benefits that cost taxpayers over $40,000 a year -- more than a minimum-wage job pays? "And what would they say about a society that supported generation after generation of such families on income taxes that 10 percent of the population pays 70 percent of, and that nearly half the population doesn't pay at all? "They would be horrified by the injustice of such tyranny of the majority, of course. But they would be no less horrified by the waste of lives that never even try to reach their full potential. This is what millions have done with the liberty that the Founders pledged their lives, their fortunes, and their sacred honor to win?" "Myron Magnet is a recipient of the National Humanities Medal. He is editor-at-large for City Journal. His new book, The Founders at Home: The Building of America, 1735-1817 , is just out from W. W. Norton." More of Your Tax Dollars Down the Proverbial Rat Hole! First, the bureaucrats who brought you the ObamaCare website HealthCare.gov fiasco "paid out nearly $29 million in prescription drugs to just 4,139 illegal aliens from 2009-11." Even better, this waste of your tax money remained unidentified until found by an IG audit. The second case comes from Ohio where a company overcharged Medicaid $1 million "in the transportation of citizens with disabilities." There, too, it required the work of the auditors who "found hundreds of cancelled trips that were reimbursed and hundreds more that were not authorized as medically necessary." Finally, the bureaucrats at the Environmental Protection Agency (EPA) released a "20-page document illustrating “funding opportunities," including "$4.5 million to study the affects of climate change on indoor air quality." "(It is) absolutely true that in the long term we will be unable to control government expenditure if the government keeps assuming new responsibilities." ~ Robert Bartley, "The Seven Fat Years"
How Much of Your Total Taxes are Redistributed? Gerald Prante and Scott Hodge of the Tax Foundation have done yeoman work in producing the extensive "special report" entitled, "The Distribution of Tax and Spending Policies in the United States (No. 211, November 2013). 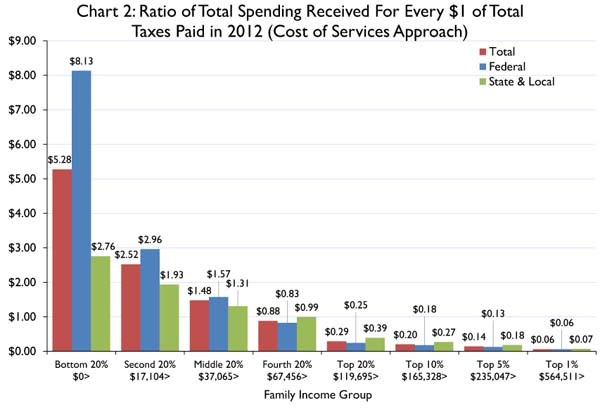 "The lowest-income families receive an average of $8.13 in federal spending for every $1 that they pay in federal taxes, while the next-lowest gets $2.96, and middle-income families receive $1.57. 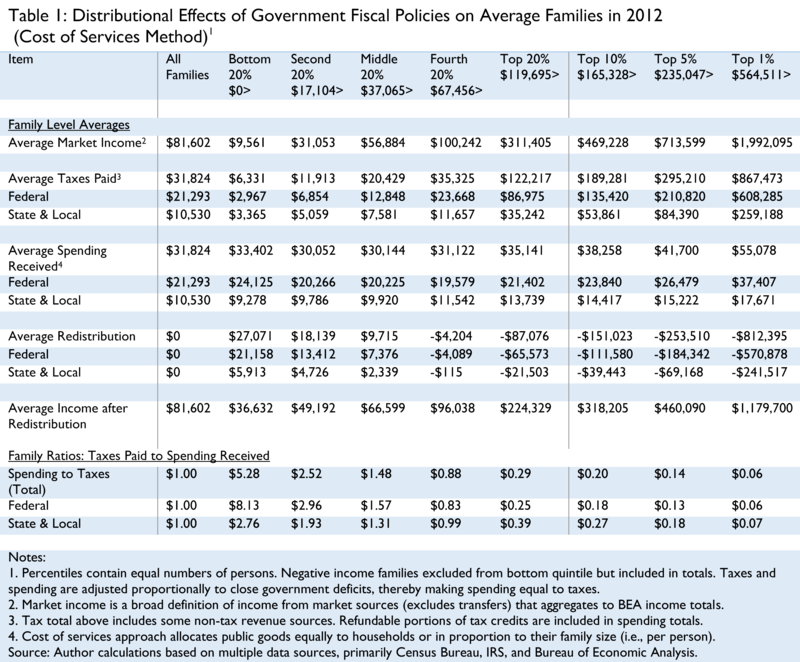 Meanwhile, upper-income families are net contributors to government. Those at the top of the middle-class receive $0.83 back for every dollar they pay in taxes, while high-income families receive $0.25." "United States governments at all levels redistributed more than $2 trillion in wealth from the top 40 percent to the bottom 60 percent in 2012. Gerald Prante and Scott Hodge present all the findings in our new study on redistribution in the United States in 2012. "On average, the top 20 percent earners lost $87,076 per person due to redistribution while the bottom 20 percent earners gained $27,071. Most of this is due to policy at the federal level, but in whole it results in a large amount of spending on behalf of the taxpayers. "In the United States, the average amount of government spending by quintile is relatively equal at around $30,000, but the tax burden is significantly progressive, with taxpayers in the top quintile paying an average of $122,217." The report contains an important "note to readers" on page 2, explaining, "It is important to note that the results featured in this paper assume a "cost of services" methodological approach . . . In the interest of full transparency, the appendix of this paper presents results under an alternative "benefit principle" approach . . . "
As you've undoubtedly gathered by now, this "special report" may require a bit of heavy lifting. If you prefer shorter summaries: here at Daily Caller and here at Personal Liberty. Again, kudos to the Tax Foundation's Gerald Prante and Scott Hodge. Consider supporting the work of the Tax Foundation here. "How can U.S. student achievement be boosted? Notably, the average number of years students are in school has little impact on economic growth, once student test-score performance is taken into account. If you aren't learning anything at your desk, it doesn't matter how long you sit there. "Nor is more money the answer. The U.S. spends on average $12,000 per pupil in grades K-12, one of the highest amounts in the world. Among U. S. states, increments in spending per pupil between 1990 and 2010 show no correlation with changes in student performance. "In Wyoming and New York, spending levels per pupil climbed at one of the fastest rates without getting any extra gains in student achievement over this time period. Florida was among the most rapidly improving states, even though inflation-adjusted state expenditures per pupil hardly changed. It matters more how the money is spent than how much is spent. Expensive but ineffective policies such as class size reduction, while valued by current school personnel, have not raised achievement. Better accountability, more school choice, market-based teacher compensation and retention policies can on the other hand boost achievement without adding materially to school costs. "Nationwide, the biggest economic gains will come many years after school improvement takes place, a fact that probably helps to explain the reluctance of the political class to commit itself to genuine school reform. Confronting the power of teacher unions and other vested interests is politically costly. But the failure to improve the education system is more costly still." "(Friedrich) Hayek said, "The curious task of economics is to illustrate to men how little they really know about what they imagine they can design." We economists have failed miserably in that task." HT His November 13, 2013 Townhall.com column; the column is well-worth reading in its entirety, and you, too, may consider it to be one of Dr. Williams's classics. He posits that we wouldn't allow Washington to be in charge of all 100 million, or more, of the nation's traffic signals or putting a Congressionally-mandated committee in charge of managing the delivery of 60,000 to 65,000 food and other items to the nation's supermarkets so why does anyone think the federal government could do a better job than the free market in making better healthcare decisions than Americans currently do? A fatal conceit, indeed. Arlington County Employees Hard at Work? NOT! Kudos to WJLA TV's ABC7 Watchdog group. In a report posted this morning, they chronicle how local government workers in Alexandria and Arlington, Fairfax and Loudoun counties "may be spending a portion of their days watching videos, searching for jobs and playing games on work computers." (HT Roger Morton). "One of the most popular sites among government employees is YouTube. For example, on just one day - Aug. 19 - Arlington employees registered about 3,800 visits on the video sharing site. "Loudoun County had more than 10,700 YouTube visits on the same day, and in Alexandria, the data uncovered 14,000 hits. "The biggest offender on this specific day were employees in Fairfax County, who logged more than 96,000 visits on YouTube on Aug. 19." The ABC7 Watchdog team found similar activity regarding employees looking for another job, shopping, visiting Facebook, vacation planning, playing games at CandyCrush.com, visiting the VirginiaGunTrader.com website, abd "looking for love." "In defense of her county's employees, Arlington County Manager Barbara Donellan cited a University of Maryland study that concluded that personal web surfing at work is a net positive to the employer. "It's all about productivity," Donellan said. "We treat our employees as adults. If someone exhibits a performance issue, we manage that issue. "In these modern times and our 24/7 workforce environment, personal time and work time blend together." Donellan said that it’s important to note that in the data provided by Arlington County, the majority of sites visited were to company email and Intranet sites. "I am aware that some staff play some popular games, (but) is this any different than allowing staff to take a few minutes to fill out a newspaper crossword puzzle?" We agree wholeheartedly with Ms. Donnellan that "all about productivity" is a primary issue. However, she takes far too sanguine a view on the corrective measures. As we growled on October 2, 2013, the Arlington County Civic Federation passed a resolution -- with a 40-2 vote -- urging the local county government to establish "an independent County budget review authority that will provide Arlington County residents and taxpayers with reasonable assurance that they taxes and fees are being effectively and efficiently used. "We repeat the Civic Federation's call for an independent budget review authority to review waste fraud and abuse in local county operations. Ms. Donnellan's comments do raise the issue of leadership and effectiveness, however. Her comments suggest she's not concerned about what employees are doing as long as new bridges "meet in the middle," cultural programs don't go over budget, and students of county schools "do well" in comparison to neighboring jurisdictions. And how does she decide "a little surfing" is ok with one supervisor, but not ok with another supervisor? And how does she know it only takes "a few minutes?" More importantly, she seems to suggest it's not important to know what goes on at the grassroots level. $165 Billion of Your Tax Dollars Used for What? Eextreme nvironmentalists and their liberal/progressive global warmist friends frequently claim that scientists who are skeptical about fossil fuels being the primary cause of global warming are beholden to the largess of large oil companies, etc. Unfortunately, those same environmental extremists don't talk about the money spent by the Uncle Sugar federal government. The folks at the Science and Environmental Policy Project (SEPP) did some number-crunching for their November 2, 2013 newsletter, "The Week That Was." The number is, to say the least, mind-boggling. "Number of the Week: $22,195,000,000 US. As required by law, the White House delivered to Congress a report stating in Fiscal Year 2013, which ended on September 30, the US government spent $22,195,000,000 on climate change matters. The main categories are: US Global Change Research Program $2.463 Billion; Clean Energy Technologies $5.783 Billion, International Assistance $797 Million; Natural Resources Adaption $95 Million; Energy Tax Provisions That May Reduce Greenhouse Gases $4.999 Billion; Energy Payments in Lieu of Tax Provisions $8.080 Billion. The $8.080 Billion buys a lot of lobbying power for the wind and solar industries. "These expenditures further support SEPP’s earlier estimates that since 1993, the US has spent over $150 Billion on climate change. The updated figure is over $165 Billion." Mind-boggling, indeed. $22.2 billion for Fiscal Year 2013 and over $165 billion since 1993. "Note that not a single one of those dollars, ostensibly spent to combat “climate change,” had an iota of impact on the climate. Nearly $2.5 billion went to fund the alarmist campaign; no wonder alarmist scientists don’t want the gravy train to end. The symbiosis is obvious: the government pays alarmists billions to spread myths about the climate, and the point of the mythology is to persuade voters to confer more power on government. And the $165 billion that the U.S. government has spent since 1993 is only a fraction of total global spending to grease the “green” machine. Lots of money to allies of big government; that is what global warming alarmism is all about." HealthCare.gov Just Another Government Computer Failure? All the recent news about the ObamaCare (technically the Affordable Care Act) website -- HealthCare.gov -- causes one to question government's competence to design and develop computer systems. Is HealthCare.gov an outlier or just another government computer failure? "How could the U.S. Government make such a mess of the roll-out of the website for ObamaCare?" He then answers by saying, "Actually, government computer systems incompetence is normal. The reaction to www.HealthCare.gov presupposes that our government normally does these things well." "The Internal Revenue Service made an even worse disaster out of its $8 billion computer upgrade project labeled it's "Business Systems Modernization." First, the IRS wasted $3 billion in the 1990s. Then the IRS stated over in 1999 with a new attempt. By 2004, eight major projects were over-budget by $200 million, according to the U.S. General Accounting Office and the congressionally chartered IRS Oversight Board. The first stage to go live was three years behind schedule and $36.8 million over budget. "Old news? Well, did we learn anything? By the time we get to ObamaCare, why is Washington still repeating the same mistakes? CIO Magazine wrote in 2004: "Contracts with vendors didn't have clear deliverables. And no one, either within the IRS or among its dozens of contractors, was held accountable for results." The IRS's "Business Systems Modernization" is not the only example Moseley wrote about. At the U.S. Transportation Department, the FAA "botched the $438 million computer upgrade for Air Traffic Controllers" and "a separate $2.4 billion high-altitude system has also gone over-budget by $300 million, and may cost yet another $200 million more." He also cites a couple of Defense computer systems that are over budget. "The website Digital Trends reported on Thursday that, based on government documents displaying contracts awarded to CGI Federal Inc., the Canadian-based company which in 2011 won a $93 million contract to build the federal healthcare exchange, the cost of HealthCare.gov was about at $634 million. "But officials tell FoxNews.com that the contract figures cited by Digital Trends dated all the way back to 2008, well before the Affordable Care Act was passed, and included other CGI Federal projects not even associated with the new Obamacare exchange. "Digital Trends has since revised its numbers down, settling on an estimate of $500 million, taking into account a figure of $398 million in obligated contracts for building the website and the entire technology portion of the FFE – which includes everything from the massive data hub, call centers, network security, training and support, financial management systems and all other information technology services that support the new online and offline marketplace, as reported by the Government Accountability Office (GAO) in June. "The site estimated that more than $100 million more had been spent on salaries and administrative costs, which were not included in the GAO tallies, bringing the figure for the FFE costs to more than $500 million. "But what do we really know about the cost of the website itself? "According to the GAO report, CGI Federal was awarded $88 million (out of the $398 million total) through March 31, for both the FFE information technology and HealthCare.gov. So far, the company has declined to comment how much of that was exclusively used for the website." "Liberals spin grandiose schemes of utopias based on their belief that government can work miracles, that government can spin straw into gold. Conservatives oppose those flim-flam scams partly because government cannot actually accomplish what liberals hope. From the Federal Reserve creating economic growth out of thin air, to inventing green energy jobs, to controlling global climate, to changing human nature, to wishing away problems, liberalism depends fundamentally on a belief in the god-like omnipotence of government. "Portrayed as heartless and uncaring, conservatives would love to see the benefits that liberals day dream about. But conservatives live in the real world, where facts govern. Conservatives are not fooled when liberals put on their Professor Harold Hill routine, trying to sell air to the voters. The limitations of government must be clearly confronted. Liberals assume that government, being their god, can do anything. Conservatives have their doubts." Kudos to Mr. Moseley and to Fox News for their reporting on the cost of HealthCare.gov. "The fundamental problem of the political Left seems to be that the real world does not fit their preconceptions. Therefore they see the real world as what is wrong, and what needs to be changed, since apparently their preconceptions cannot be wrong." "The Internal Revenue Service issued $4 billion in fraudulent tax refunds last year to people using stolen identities, with some of the money going to addresses in Bulgaria, Lithuania and Ireland, according to an inspector general's report released Thursday. "In the U.S., more fraudulent returns went to Miami than any other city. Other top destinations were Chicago, Detroit, Atlanta and Houston. "The IRS has stepped up efforts to fight identity theft, but thieves are getting more aggressive, said the report by J. Russell George, Treasury's inspector general for tax administration. Last year, the IRS stopped more than $12 billion in fraudulent refunds from going to identity thieves, compared with $8 billion the year before." "For this year, the IRS says it has developed a computer program that helps agents spot when multiple refunds are going to the same address or bank account. As of May 30, the program identified 154,302 tax returns and stopped $470 million in tax refunds from being issued, the report said." Guess we'll have to wait for a future IG audit to learn how effective the IRS's new computer program really is. Unfortunately, a $4 billion fiasco makes it tough to swallow that bit of hope, which the IRS holds out. Are the Young Getting Ripped-off by ObamaCare? An op-ed posted yesterday at the Wall Street Journal website is proving rather popular. It was written by Carl Schramm, a university professor at Syracuse University and former president of Fortis (now Assurant) Health Care. "When ObamaCare is under attack, its defenders retreat to several well-worn claims. Among them is a provision that compels insurance companies to allow parents to keep their "children" ages 21 to 26 on their family policies. "Yet this part of the Affordable Care Act was not engineered in response to any noticeable interest group. Instead, political considerations are responsible for the provision -- which is an unnecessary and a deceptive ripoff of the"young healthies." "Second, government's actuaries are well aware that this much-touted benefit basically costs nothing. Actuarial and other research suggests that the average male sees a physician six times between the ages of 21 and 35. The parental coverage provision seemed like a "freebie" for the administration's universal coverage sales pitch. "Third, ObamaCare's financing won't work unless "young healthies" (or their parents) pay through the nose for coverage under parental plans or via the individual mandate. The 18-26 age group is the lowest user of care, the least costly to cover and the most profitable of all health-insurance coverage. Yet the group faces extraordinarily high ObamaCare rates"
"Given that 64-year-olds use on average six times as much health care as 19-year-olds, the Affordable Care Act forces young people to pay considerably more than the cost of their own care." The entire op-ed is well-worth reading because Schramm provides an approach to providing young people a much more cost-effective health insurance plan that if "coupled with federal legislation limiting medical malpractice claims and permitting carriers to offer more efficient multistate products—would provide health reform without the current drama of incompetency and injustice that will inevitably deny us all affordable care." While Schramm writes that some young people "may be beginning to understand that the high cost of their plans reflects the redistribution of their wealth to older people and a bunch of mandated services t hat don't make sense for them," more than one young person has told me that ObamaCare is "a good start" to reforming America's health care system, suggesting they may not have a problem with wealth redistribution generally. Yesterday's elections kept the Arlington Sun Gazette's Scott McCaffrey's busy, both yesterday and today. "With results starting to quickly pile up following the 7 p.m. close of polls at the county’s 52 precincts, Democrat Fisette was holding a steady lead against Green Party challenger Audrey Clement. By 8:55 p.m., with almost all precincts reporting, Fisette was taking 66 percent of the vote to 31 percent for Clement. The remainder were write-ins. "After several false starts, Fisette was elected to the board in 1997, and has faced only limited challenges since. Republicans did not field candidates against him in 2009 or 2013. "Supporters of a housing authority failed to convince voters that the idea was worth exploring, making the 2013 vote a repeat of 2008. In all, referendums to establish a public-housing authority in Arlington have failed four times in the past 55 years. "With nearly all precincts reporting, the measure was going down to defeat by a decisive margin of 70 percent to 30 percent. "Among Arlington precincts, Fisette scored his best result at Arlington Mill, where he rolled up 75.3 percent of the vote, followed by Glebe at 75.2 percent. His weakest result came in Virginia Highlands at 57.5 percent, followed by 57.9 percent at Crystal Plaza." We also learned in the same story that "School Board Vice Chairman James Lander, who was unopposed for a second term, won 96 percent of the vote, with the remainder going to write-ins." "His decision will bring to an end County Board service that began in 1996, when Zimmerman won a special election to succeed Mary Margaret Whipple, who was elected to the state Senate. And it will set up a special election next spring, with the winner serving the remaining months of Zimmerman's term." Here's ARLnow.com's reporting on Zimmerman's resignation. According to Joe Warren, who has closely followed the saga of the Columbia Pike streetcar comments, "Zimmerman's departure is a tacit admission that the Col Pike streetcar is in dire straits. He was THE one constantly pushing for this -- overwhelming the other county board members." Should be something to watch. You can read more about Zimmerman's resignation in this county press release. UPDATED (11/7/13). In the original version of the last paragraph, I kept the source of the quote anonymous since I had not received permission to divulge the source, but I now have his permission. CNS News' Barbara Hollingsworth reports the Federal government's Centers for Medicare and Medicaid Services (CMS) -- the same folks who brought us the ObamaCare HealthCare.gov website fiasco -- "spent $29 million on (Part D) prescription drugs for 4,139 illegal aliens." "The IG also recommended that CMS take steps to recover the $29 million. However, CMS said that “there was no effective way to fully recover the improper payments in question without first implementing the appropriate policies and procedures” that would have prevented the overpayment problem in the first place." Guess when it's taxpayers money, there's less incentive to recover those dollars. Wonder if there would be more incentive for those CMS employees if the money came out of their paychecks? Just asking! "Politicians love to play Santa Claus by handing out favors to voters, while depicting insurance companies as Scrooge when they raise insurance premiums to cover the costs of government mandates. "This kind of political game has been played for generations in other areas besides insurance." On the ballot Tuesday, November 5, 2013, in addition to voting for governor, lieutenant, attorney general, delegates and local officials, Arlington County voters will be asked to vote "Yes" or "No" on whether "there is a need for the redevelopment and housing authority to be activated in the County of Arlington," the official wording according to the county's FAQ available at the Office of Voter Registration's website. 1. Why is the question worded this way? "The Housing Authorities Law in the Code of Virginia requires this language. By law, redevelopment and housing authorities exist in all localities but are dormant until activated by referendum." 2. How did the question get on the ballot? "The Housing Authorities Law provides for the question to be placed before the voters upon petition of at least 2% of duly qualified, registered voters (there are 142,271 registered voters in Arlington). With at least 2,845 verified petitioners, this requirement was met and the referendum was authorized by the Circuit Court. This is one of the few instances where State law permits a voter referendum." The FAQ answers other questions, and contains a helpful chart comparing existing powers of the county, a housing authority, and profit or non-profit developers. Similar proposals were rejected three previous times, most recently in 2008, almost always by significant margins. Arlington County's proposed FY 2014 budget for Arlington County contains almost $52 million for various multi-departmental housing programs, including over $18 million in Section 8 vouchers, $8 million in rental assistance housing grants, and $5 million in tax relief for the elderly and disabled. According to the Arlington County Democratic Committee's resolution opposing the housing authority, total local, state and federal funds are actually $55 million, including $20 million for development of subsidized housing, and 1,383 Section 8 vouchers. They also note the county "is creating and preserving more affordable housing units per 1,000 people than any other county in Northern Virginia, and "as of 2012, Arlington had created 6,585 committed affordable rental units - about 15% of Arlington's entire rental apartment stock." The Arlington Green Party is the primary supporter of the housing authority. The organization's chairman, Stephen Davis, addressed the Arlington County Board on September 21, 2013 in support of a housing authority. A subsequent post another blog on September 29 addressed what they called "half truths and distortions on housing authority." For the record, we do not attempt to settle this dispute with what they label an "Arlington trade association." The Arlington Sun Gazette provides reports both the local GOP and Democrats passed resolutions opposing the housing referendum. At ARLnow.com, Mark Kelly devotes one of his weekly opinion columns against the referendum. What Arlington County needs is a free market in housing that would provide working families with truly affordable housing, and not subsidized housing. In as much as Arlington County taxpayers are already overburdened with too many taxes and too much government, and since a housing authority would likely do nothing but add to the bureaucracy, the Arlington County Taxpayers Association urges a NO vote against the housing referendum. We've growled several times -- most recently on August 29, 2013 -- about the $1 million so-called Super Stop single bus stop, which the Arlington County Board built on Columbia Pike. ". . . that state transportation funds combined with some local resources could be used to build 12-15 of the shelters, while 3-5 could be build(sic) with contributions from private funds, including as proffers from developers seeking approvals for large scale mixed use projects." Sure doesn't sound like Falls Church plans to build $1 million bus stops as a vanity project for the members of their City Council. Rather, it sounds like there's a lesson there for the five County Board masterminds.